This highly specific monoclonal antibody reacts with nitrotyrosine, both with the free amino acid as well as with proteins containing nitrotyrosine. Our Abpromise guarantee covers the use of ab7225 in the following tested applications. Nitric oxide (NO) is a product of the enzymatic conversion of arginine to citrulline by nitric oxide synthase. NO reacts rapidly with superoxide to form peroxynitrite. At physiological pH and in the presence of transition metals, peroxynitrite undergoes heterolytic cleavage to form hydroxyl anion and nitronium ion, the latter of which nitrates protein tyrosine residues. Thus, the presence of nitrotyrosine on proteins can be used as a marker for peroxynitrite formation in vivo. The presence of nitrotyrosine has been detected in various inflammatory processes including atherosclerotic placques. 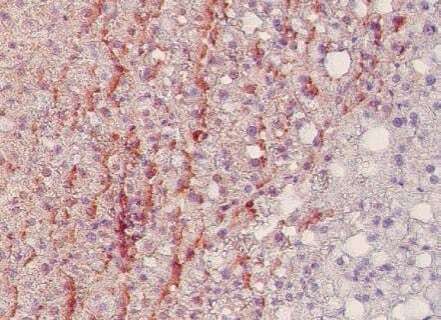 Nitrotyrosine in human liver of severely obese patients. Staining of paraffin tissue section with ab7225 at 2 μg/ml. Publishing research using ab7225? Please let us know so that we can cite the reference in this datasheet. Thank you for your inquiry. I would recommend to try a range of dilutions (1:1000- 1:20,000) for this antibody in Western blot. The optimal dilution needs to optimized according to the results. What tissue should I use for a positive IHC control? I want to know the consentration of mouse monoclonal to Nitrotyrosine (ab7225) in the immunohistochemistry immediately. Can you reply my email immediately? Thank you for your email. To use ab7225 in IHC, I would recommend titrating the antibody from 1:20 - 1:200, but you will have to optimize based upon your results. If you have any additional questions, please contact us again. ANTIBODY CODE ab7225 BATCH NUMBER 4915M13 ORDER NUMBER -- NOT SPECIFIED -- DESCRIPTION OF THE PROBLEM We have this antibody in our possession and would like to know a) what titer to try on paraffin embedded mouse lung, and b) how old is this particular lot. Thank you for your enquiry. I'm going to need your order number to tell you precisely how old the stock you received is. To use ab7225 in IHC, I would recommend starting at a dilution of 1:10, but you should try a range in order to optimize the best results. Thank you for your enquiry. The following article is a reference for ab7225: 1) Jessica Ter Steege et al: Nitrotyrosine in plasma of celiac disease patients as detected by a new sandwich Elisa: Free Radiac boil Med 25 (8): 9543-963, 1998. For immunohistology, the dilutions to be used depend on the detection system applied. It is recommended that you test the reagent and determine your own optimal dilution. The typical starting working dilution is 1:10. We would like to warn you that it is very important to keep the following in mind. Do not add sodium azide or any nitric containing preservative since this will affect the antibody! This means for every solution used in the test. Furthermore we would like to advise you to use good positive and negative controls. Is it expectable that the pig liver you tested contains Nitrotyrosine? We hope this information will be helpful to you. If you have further questions please do not hesitate to contact us. Does this antibody work well in paraffin? Does it work in rats and mice? What are suggested fixatives and pretreatments? This antibody has been found to work well in formalin fixed paraffin embedded tissue and is expected to recognise nitrotyrosine in all species. Heat mediated antigen retrieval will probably be beneficial. Please refer to the Antigen Retrieval protocol, linked on the right hand side of the Abcam homepage.